Eureka Projector Rentals rents compact portable sound systems from Fender and Mackie. These systems are designed for easy operation and for the average user to operate trouble free. 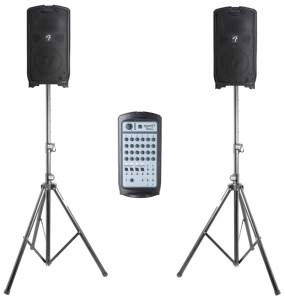 includes all-in-one amplifier/mixer two speakers and a wired hand held microphone. A cable to connect your iPod or similar device is included free of charge. including Arcata, Fortuna, McKinleyville, Blue Lake and more.